Nominate a system to host the printers and the PaperCut NG/MF server software. On the nominated host system, ensure that the Guest account is disabled. Select Start > Control Panel > Administrative Tools > Computer Management > Local Users and Groups > Users. The Local Users screen is displayed. Right-click the Guest user; then select Properties. On the General tab, select Account is disabled. This should also be performed for any system running a Release StationPrint Release Stations place a print job on hold and allow users to release it when required. Often a Release Station is a dedicated PC terminal located next to the printers, however, Release Stations can take other forms such as a web browser based interface. Some common examples where Release Stations can be used include secure printing, approved printing, and authentication. In a secure printing environment jobs are only printed when the user arrives at the print area and confirms his or her identity. This ensures the user is there to collect the job and other users can't "accidentally" collect the document. In some organizations it may be appropriate to hold jobs until they are approved by selected individuals. A good example would be a teacher approving printing on an expensive color printer. Hold/Release queues can be used as a form of authentication in an unauthenticated environment. Users must authenticate prior to releasing their jobs allowing PaperCut NG/MF to confirm their identity..
On the nominated system, set up user accounts for all users. Install the PaperCut NG/MF server software and complete the configuration wizard. Print from another workstation. The job should list in PaperCut NG/MF under the user "guest". 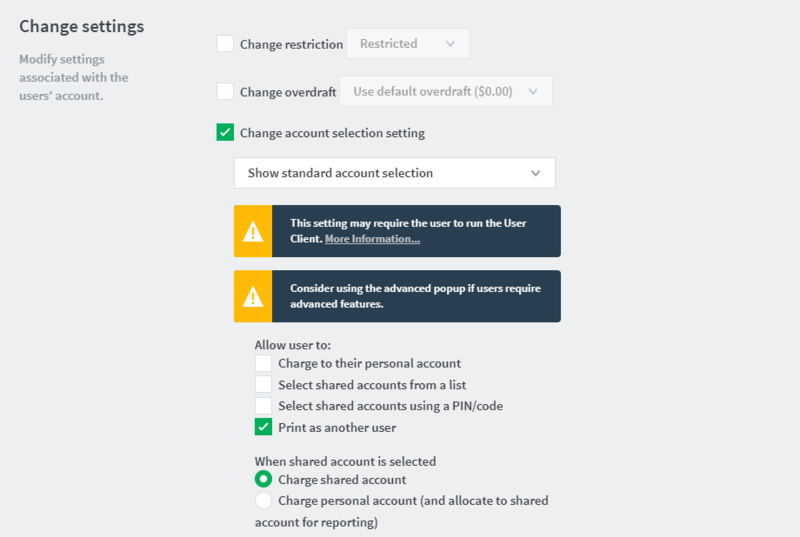 Select the Change account selection setting check box. Install the client software on each workstation. See User Client. When the user prints to the shared printer, a popup now asks the user to enter a username and password.